And here's the other half. A cloven developed anti-personnel grenade, the Plasma Grenade uses the power of the fourth state of matter to create an efficient and effective explosion. 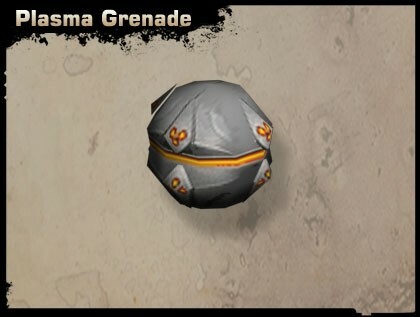 Unique among all grenades is the Plasma Grenade's ability to adhere to almost any surface it lands upon; a characteristic that clever soldiers exploit as the unfortunate Chimera victim attempts to hide behind cover with its comrades with the item still attached. 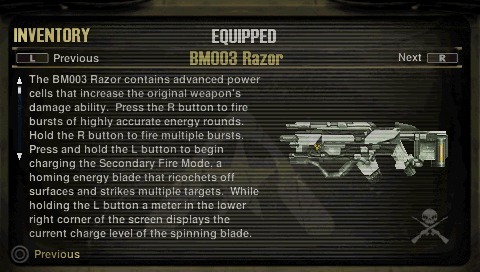 Effectively a reversed engineered Bullseye by the British Military, the Razor is none the less a unique derivative of the Chimeran Hybrid's standard Small Arm. Though they were unable to replicate the energy bolt homing capabilities of the original, instead generate and launching a disk of directed energy that can ricochet off walls and hard surfaces and devastate a cluster of Chimera and is the only directed energy weapon to be usable under water. Effectively a reversed engineered Bullseye Mk. II by the British Military, the Razor is none the less a unique derivative of the Chimeran Hybrid's standard Small Arm with stronger bolts of energy for maximum stopping power. Though they were unable to replicate the energy bolt homing capabilities of the original, instead generate and launching a disk of directed energy that can ricochet off walls and hard surfaces and devastate a cluster of Chimera and is the only directed energy weapon to be usable under water. Been meaning to do these weapon ideas from my custom setting for a while now. The spam bots were no help. Designed and manufactured by Gober and Stein Mass Armaments GesmbH, the Vollstreckungswaffe was designed for police officers and private security forces of the galaxy in mind and in particular individuals who are not as gun savy as a civilian would expect from their position. At its core, the Vollstreckungswaffe is a bullpup LLG design with a rear downward ejection of spent LLCs; standard for all small arms across the entirety Human Ecumene including the Great Galactic Powers when one expects a seamless transition from open battlefields to close quarters environment without sacrificing the advantage of range. The Downward ejection of spent LLC rounds in addition to ambidextrous controls allows for rapid shoulder transitions to keep much of the body in cover when rounding corners either on an open battle field or within the tight confines of close quarter battles. To ease the training and maintenance of the Vollstreckungswaffe, the action of the LLG is that of a Lever-Delayed Blowback with only four parts to the overall design in addition to ease of manufacture. Not only that, but the bolt carrier of the Vollstreckungswaffe utilizes a pair of alloy guide rods which ultimately simplifies the construction of the receiver which is little more than ejection molded, military-grade hardened bio-polymers. This and many other design elements such as a largely bio-polymer construction with limited alloy upon strategic locations upon the Vollstreckungswaffe such ease in training and maintaining that many consider it a step above the Rocket Gun found in nearly all Civil Defense Militia Armories across all of the Human Ecumene, but only just. By default, the Vollstreckungswaffe comes equipped with a low velocity, single round gun launcher purposefully modified to only utilize less-than lethal anti-riot munitions. However, that does not equate to the limited versatility upon the modern battlefield as numerous gun launcher designs can be retrofitted with after-market products, but such procedures can only legally be performed by licensed GS Gunsmiths and technicians. Designed, Engineered, and Manufactured by the Fabryka Broni i Zbrojeń Torusk, the so-called Modułowa Platforma Szturmowa do Służby "Ryk Grzmotu" is an elite, fully modular LLG weapon that forms the core of a family of such Niezależny Użytkownik Bezpieczeństwa small arms that can range from an Assault Rifle, to a Battle Rifle i.e. Designated Sharpshooter Rifle, or a Squad Assault weapon to fill the needs of the individual shooter either uniformed or PMC. As its name suggests, the Ryk Grzmotu is a fully customizable bullpup that utilizes variable LLG calibers in the form of Caliber Conversion Kits that replaces the bolt head, floating barrel, and magazine well to fit the desired round caliber. In a promotional stunt, FBZT was able to convert the Ryk Grzmotu from an Assault LLG into a configuration able to fire 9mm Pistol-type LLC rounds. It's ambidextrous charging handle and forward assist is reciprocating thanks to its near flush alignment with the full length optic rail that is accessed through either lever lugs upon either side of the charging handle or the small gap between the optic rail and the charging handle that allows a single digit space to grab hold of it, depending upon the design of the upper reciever. Though its caliber conversion is largely its central feature, the largely military-grade hardened biopolymer constructed LLG Bullpup is designed to have its upper receiver be replaced with an alternate upper receiver to allow it to become a radically different LLG small arm as needed. As per the instruction manual, it is highly advisable that one replaces the modular trigger assembly group to fit the desired weapon configuration. The thumbhole grip stock (mostly to skirt certain legal issues) of the Ryk Grzmotu also features an adjustable buttstock and comb to allow the user personalized ergonomic preference such as the use of combat body armor or Vac-Suit. Thanks to the concept of the Revolver Rifle, and in particular a video about a modern variation of it, I was inspired to make this design for the Franco-Averon civilian market. The Arme à énergie dirigée de l'usine d'armement Averon-Calais Projet 11 Modèle sportif is the civilian market of a main battle DEW which predated the Averon Alliance and the Alliance Security Enforcement Organization branch. At its core, the AEDUA P11MS utilized the same Balise Légère cartridge technology that so often characterize Franco-Averon Directed Energy Small Arms in the form of a top-break revolver long gun to which the individual capacitor rounds are loaded via a moon clip, speed strip, or speed loader though optionally they may be placed individually if the user is so inclined. Despite its bullpup design, the AEDUA P11MS retained the Franco-Averon "contemporary Napoleonic" ascetics of muzzle-loaded rifle design from the gunpowder era of warfare, even with the reflex sight added to the weapon though the backup iron sights do little to ruin the ascetic illusion. However, due to the nature of the Balise Légère cartridge, the laser portion of the combination weapon is unable to change the default setting of the assault laser, in this case Anti-Personnel, and must exchange it with a different weapon platform as an alternative platform. Fortunately, the default range of the assault laser may be altered with the use of external and interchangeable secondary lenses. As a civilian model, much of its original battlefield design were decidedly de-militarized to make it suitable for use by unaugmented individuals but also as either a home defense weapon or sporting and hunting DEW for the Franco-Averon enthusiast as well as to make the item legal for civilian ownership. However, it had not stopped the most determined of owners to make the weapon more formidable when up against the more fearsome of fauna that stalk the fog-laden wastelands of Premier Averon.